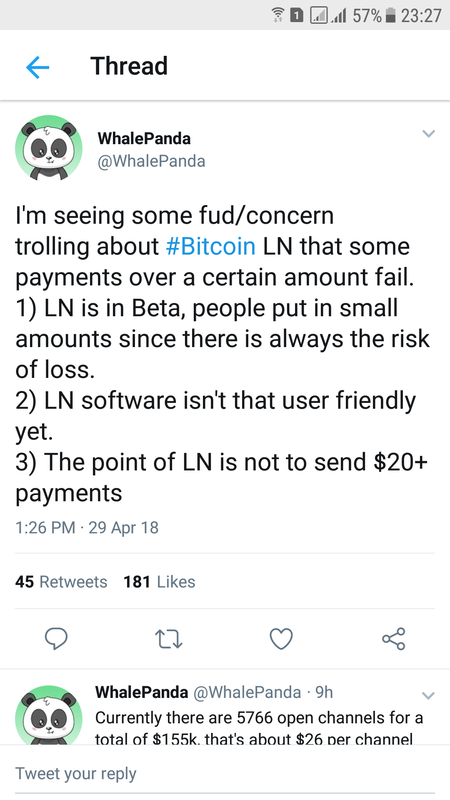 Bitcoin LN network is still being tested. Don’t risk big amounts and yet, give it some time and patience to grow and stabilize. I’m working on some quirks of a wallet I’m developing, and one of the issues is what to do with change amounts that are larger than dust ~600 satoshis, but less than a practical amount to be sent again with a fee. Should I return the near-dust amount as change, or just tack it on as additional mining fees? For example, let’s say a user spends an amount that after paying to an output and a sufficient fee leaves only 1,000 satoshis as change. Should I send those 1,000 satoshis as change even though 1,000 satoshis is too small to be spent again with a sufficient fee? Even with fees as low as 10 satoshis per byte with one input and output (P2PKH) you’d need at least 2,000 satoshis for fees. I’m thinking it might be better to just put the leftover towards additional mining fees if change amount is below a certain threshold, say 3,000 satoshis. An address with just 1,000 satoshis is mostly useless, and would just add to the growing UTXO set that would likely never be spent. Does this approach seem appropriate, or am I “robbing” users of their dust? I tried it for the primary exchange. With secondary exchange it works like a charm. Is it possible to hide top and bottom line? In other words primary exchange? Is it safe to use Bitaddress.org to generate private keys and use them to generate multi-sig address, writing private keys on a paper. Then signing transactions from my multi-sig address on offline computer.